Venture out of the city with trips to Playa del Carmen (Scuba & Snorkeling, La 5ta Hacienda, & more). There's still lots to do: get close to the beloved marine mammals with a swim-with-the-dolphins experience, browse the different shops at La Isla Shopping Village, stop by Plaza Las Americas, and enjoy the sand and surf at Playa Tortugas. To see where to stay, photos, ratings, and tourist information, go to the Cancun route planner. London, UK to Cancun is an approximately 12.5-hour flight. You can also do a combination of train and flight. Traveling from London to Cancun, you'll gain 5 hours due to the time zone difference. Traveling from London in October, things will get much warmer in Cancun: highs are around 35°C and lows about 26°C. Cap off your sightseeing on the 28th (Sun) early enough to go by car to Tulum. The only Mayan site built to overlook the ocean, Tulum remains a coastal paradise preserving the last vestiges of a pre-Hispanic civilization. When in Tulum, make a side trip to see Cobá Zona Arqueológica Cobá in Coba, approximately 44 minutes away. 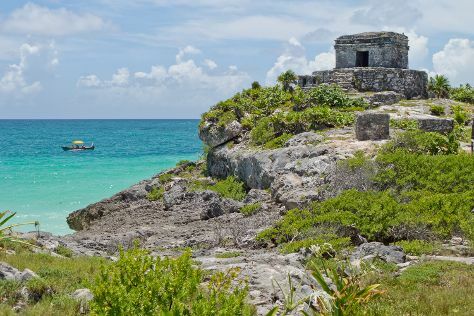 There's much more to do: explore the ancient world of Ruins of Tulum, Head underground at Grand Cenote, soothe aching muscles at some of the top local wellness centers, and shake up your sightseeing with a climbing tour. To see more things to do, other places to visit, ratings, and more tourist information, read Tulum trip builder app . You can drive from Cancun to Tulum in 2 hours. Alternatively, you can take a shuttle; or take a bus. In October, plan for daily highs up to 34°C, and evening lows to 25°C. Finish your sightseeing early on the 1st (Thu) so you can drive to Merida. Yucatan's busy capital, Merida remains a mid-sized urban center offering an impressive list of cultural activities, eclectic nightlife, and a chance to see tropical examples of French and Italian architecture. Explore the numerous day-trip ideas around Merida: Uxmal (in Muna), Chichen Itza (Chichen Itza, Cenote Ik kil, & more) and Uxmal (in Uxmal). And it doesn't end there: make a trip to Ruta Puuc, stop by El Estudio!, admire the striking features of Paseo de Montejo, and pause for some photo ops at Statue of Hideyo Noguchi. For more things to do, ratings, other places to visit, and tourist information, refer to the Merida travel app . You can drive from Tulum to Merida in 3.5 hours. Alternatively, you can take a shuttle; or take a bus. Expect somewhat warmer weather when traveling from Tulum in November: highs in Merida hover around 36°C, while lows dip to 24°C. Finish up your sightseeing early on the 5th (Mon) so you can travel to Tuxtla Gutierrez. Tuxtla Gutiérrez is the capital and the largest city of the Mexican southeast state of Chiapas. Kick off your visit on the 6th (Tue): admire nature's wide array of creatures at Miguel Alvarez del Toro Zoo (ZOOMAT), explore the stunning scenery at Canon del Sumidero, and then see the interesting displays at Museo del Cafe de Chiapas. To find photos, ratings, traveler tips, and tourist information, use the Tuxtla Gutierrez visit site . Explore your travel options from Merida to Tuxtla Gutierrez with the Route module. You'll gain 1 hour traveling from Merida to Tuxtla Gutierrez due to the time zone difference. In November, plan for daily highs up to 34°C, and evening lows to 22°C. Finish up your sightseeing early on the 6th (Tue) so you can travel to Mexico City. Mexico City is known for museums, historic sites, nightlife, shopping, and nature. Your plan includes some of its best attractions: see the interesting displays at National Museum of Anthropology (Museo Nacional de Antropologia), get engrossed in the history at Museo del Templo Mayor, get a sense of history and politics at National Palace (Palacio Nacional), and pause for some serene contemplation at Basilica de Santa Maria de Guadalupe. Use the Route module to find suitable travel options from Tuxtla Gutierrez to Mexico City. In November, Mexico City is slightly colder than Tuxtla Gutierrez - with highs of 26°C and lows of 11°C. Cap off your sightseeing on the 9th (Fri) early enough to travel back home.